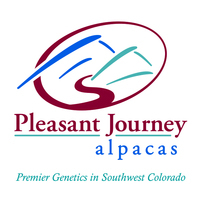 CONGRATULATIONS TO TALL GRASS FARMS ALPACAS for their purchase of PJA Graycee Spirit! 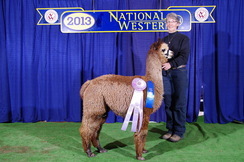 Graycee Spirit of PJA is sired by our very own Adonnis' Altitude NS and we could not be more proud. This young female holds the same statuesque presence of her sire. 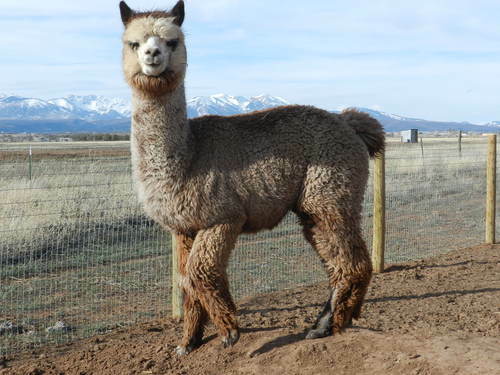 Her beautiful head style and consistent crimp in her fiber are traits of Altitude. Fiber is very, very fine. She show great bone and the straight topline. Graycee is a classic medium rose grey with medium brown in blanket. 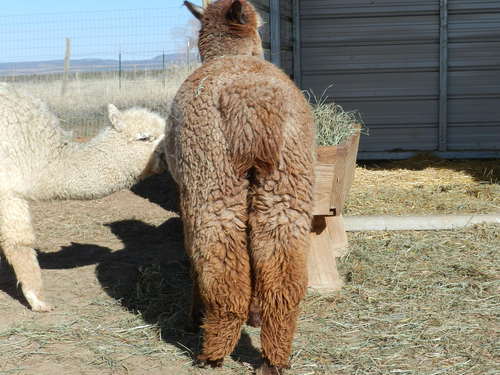 We have not run a histogram on her as her first shearing was cria shear so we are looking forward to seeing what she is packing in her fleece this year. 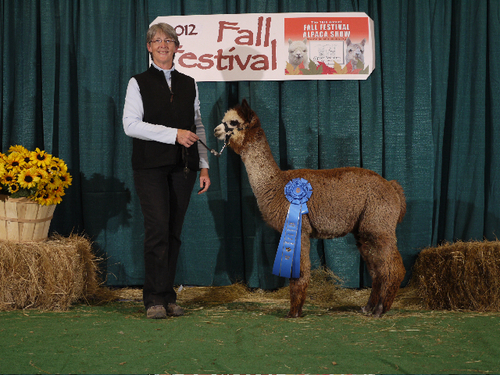 Graycee's lineage is backed by some of the best alpacas in the industry with ATV Adonnis, Crescent Moon's Rayo Del Sol, Mr Roosevelt and Peruvian Andrajo on her sire's side. Her dam brings in the Caligula's Accoyo Poseidon, Pperuvian Caligula, 4Peruvian Legacy and Royal Fawn, just to name a few. Check out her ARI certificate to see all that she packs with her! 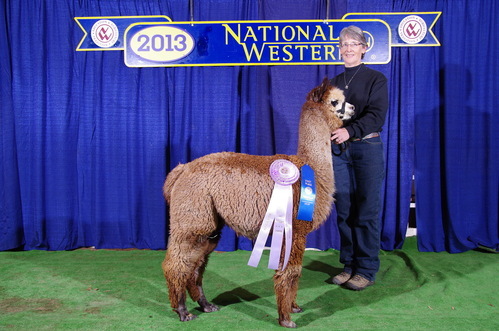 Along with her 1/2 siblings PJA Altitude's GreyHawk and Altitude's Princess Serendipity, Graycee helped Adonnis' Altitude NS capture his second 4th place ribbon in Get of Sire at GWAS 2013. It is her extremely fine, consistent fleece that bring her to the top. We began showing Graycee in the fall of 2012 and will continue showing in 2013. Of course, she can be yours to show instead! Bring the top genetics into your herd and put this young female into your own foundation line up. 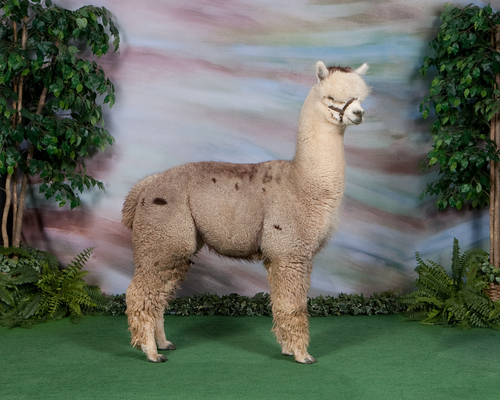 ** National Western Stock Show- 1st place and Reserve Color Champion**- judge stated "very fine fleece, very consistent through out the blanket. Strong bone structure and conformation". This girl sells with either a breeding when she is ready to our .38 Special son, NeverSummer's Manchester or the breeding can be transferred to one of your own females and you can choose your own special breeding for Graycee. We offer financing and are more than willing to work great terms.